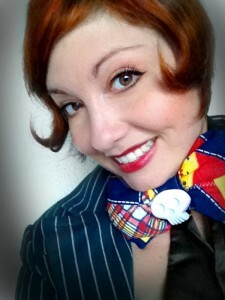 Miss Mindy sits at her desk, facing the window of the WonderGround Gallery as crowds pass by. Her palette is dotted with dollops of paint and she swirls her paintbrush in the calming blues and whites. Perfecting a shade of cerulean blue, she carefully dabs at the lightly-sketched drawing of Ariel she prepared earlier. 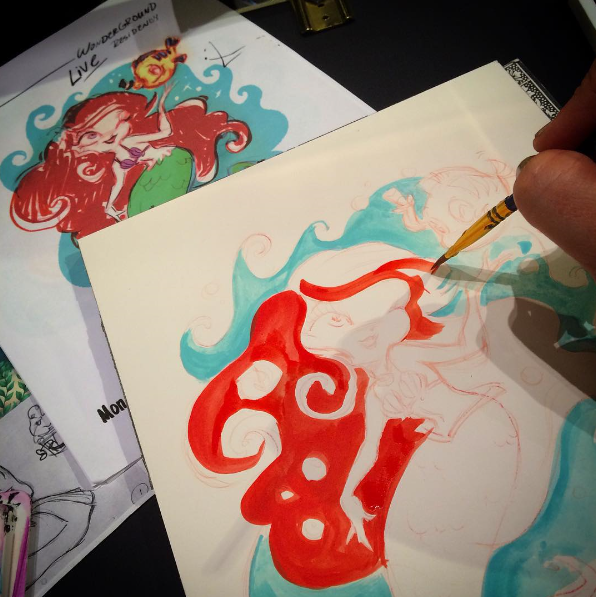 With just a few strokes of her paintbrush, the vibrant, blue world of this red-headed, little mermaid began to take shape. 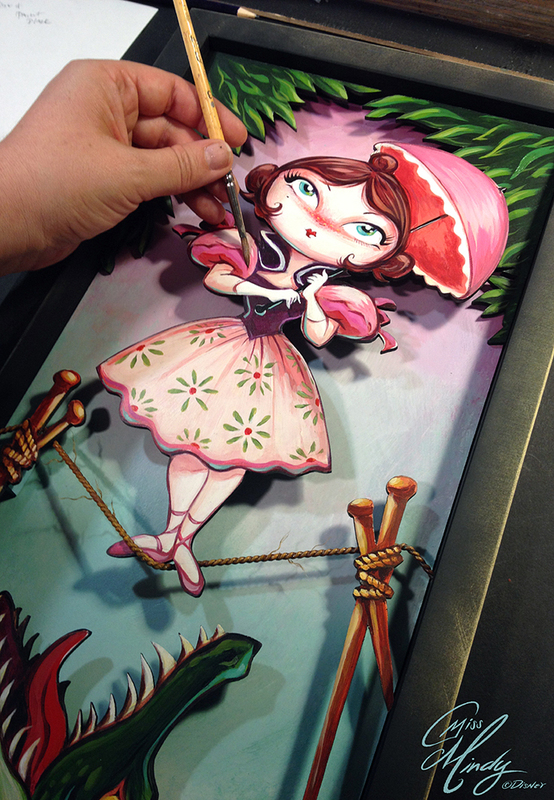 Mindy O’Brien, better known as Miss Mindy, was invited for the third time as this month’s “Artist in Residence” at WonderGround Gallery in Downtown Disney District. 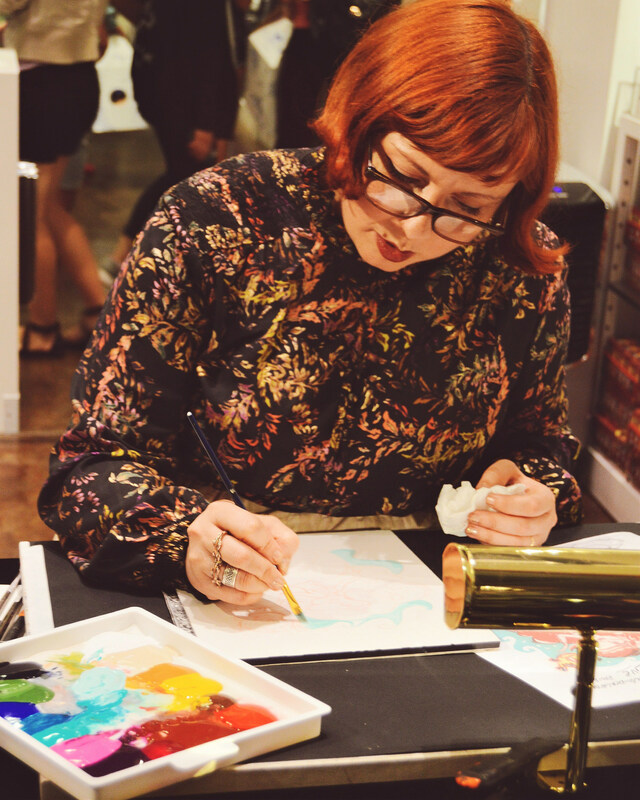 Throughout October, this Los Angeles native has been showcasing her work, meeting with supporters of her art, and performing live painting demonstrations. Just last month, O’Brien debuted her first collection of Vinylmations – “Designer Series 1,” featuring the Fab Five and Tinkerbell. 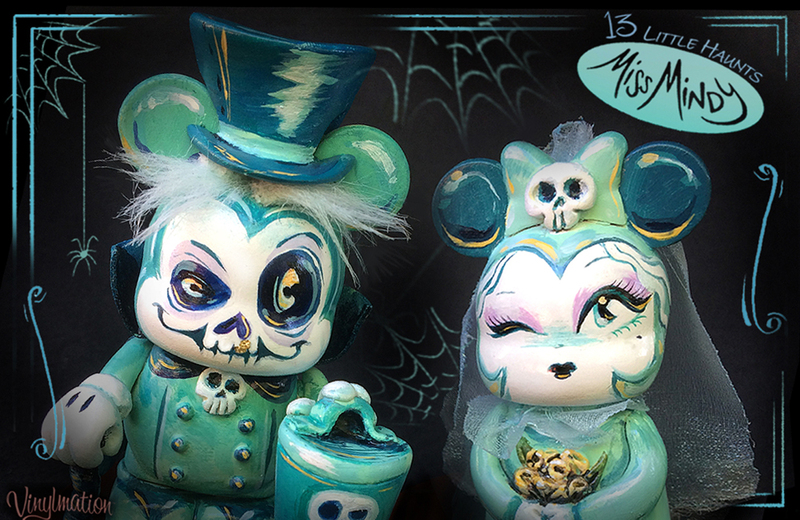 This month, in keeping with the Halloween season, she released “13 Little Haunts,” her latest collection of custom Vinylmation figures inspired by the Haunted Mansion. “My work is hand-hewn and relatively immediate in meaning like Folk Art, but I was trained professionally in animation so my characters tend to have exaggerated forms and proportions like in cartoons,” said O’Brien. It was this style, versatility, and craftsmanship that caught Disney’s attention in January of 2012 and she was invited as a guest artist. However, O’Brien’s Disney story comes much earlier as she was inspired in her early childhood by her own grandmother, Mary Ellison Allen. Her “Grandmama Mary” was an ink and paint girl at the Walt Disney Studios in the 1930s, working on the beloved classics Snow White and Pinocchio. O’Brien remembers them playing drawing games like “Cootie” where players compete to draw bug-like creatures based on whatever combination of body parts they were paired with. “Her pencil line was so fluid and gorgeous, I just had to learn how to draw as effortless as she did. She passed away when I was 12, but her impact has stayed with me all this time. She wore bright red lipstick and tiny polyester suits. I swear, I can still see her red hair all pinned up, sportin’ a 70’s pattern scarf, and smell her awesome cinnamon custard recipe,” said O’Brien. O’Brien and her grandmother are an example of generations of Disney artists who have helped create and reimagine unforgettable characters. 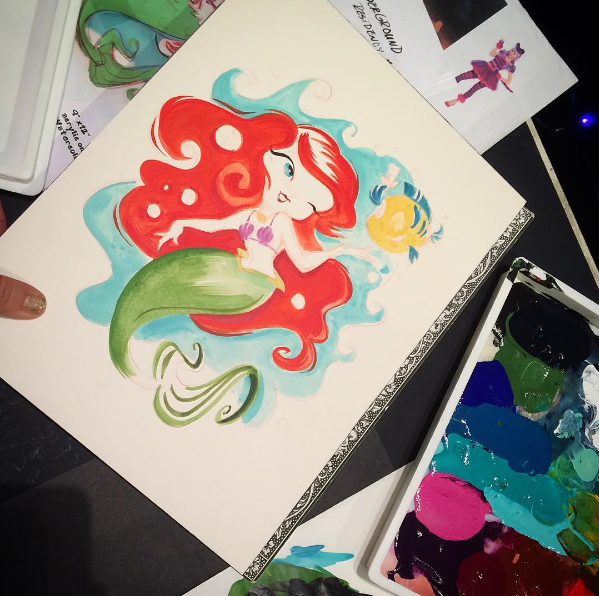 Since 2012, O’Brien has been creating inkwork, pop-up paintings, toys, and sculptures in homage to classic Disney characters, some of which her own grandmother helped to create. 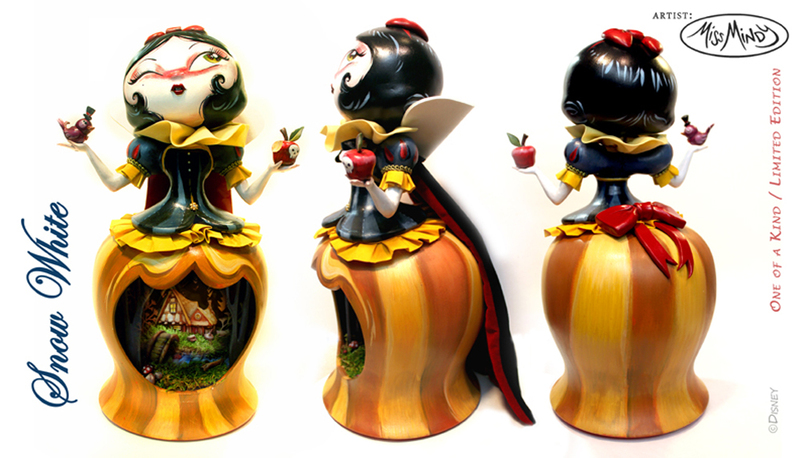 O’Brien’s latest foray into Vinylmation figures has been a rewarding experience for her. It took almost a year and half for her design to manifest itself on store shelves. In Designer Series 1, she worked with Disney artist, Thomas Scott in brainstorming designs of the characters and ensuring they translated into the 3D form. For the past three years, O’Brien has released a “Little Haunts” series of 13 one-of-a-kind, hand-made Vinylmation figures inspired by characters from one of her favorite attractions, the Haunted Mansion. Each series focuses on a set of specific characters such as the singing busts and the bride and groom for the first and second series, respectively. This year, O’Brien paid tribute to Hattie, whose ghostly reappearance was celebrated by many guests, and Madame Leota. These 3-inch, hand-painted figures are embellished with sculpture and glow in the dark. “It’s so cool. Every year, they’ve sold out, and I adore the feedback and excitement from all my collectors about the series. Many have made it a yearly pilgrimage to try and nab one of these hand-made creations. I only make 13,” said O’Brien. 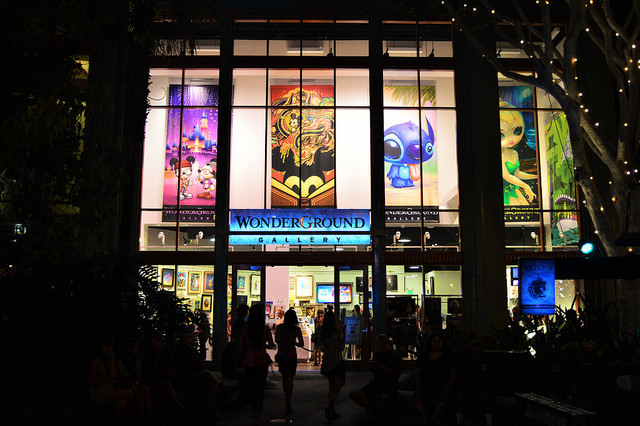 The WonderGround Gallery’s monthly “Artist in Residence” is an excellent way to bridge the gap and connect with an emerging generation of artists. Apart from celebrating and reinventing beloved Disney characters for a contemporary audience, the Downtown Disney gallery also showcases non-Disney work from local artists like O’Brien. “Talking with the young artists and seeing their excitement is one of my main loves for doing a residency once a year. It really inspires me to know how many great storytellers and picturemakers are out there for our future. I think Walt would be thrilled to see different twists on the Disney characters, not to mention the artist’s personal, non-Disney work. Because let’s face it, all ideas are new at some point and start from the imagination,” said O’Brien. 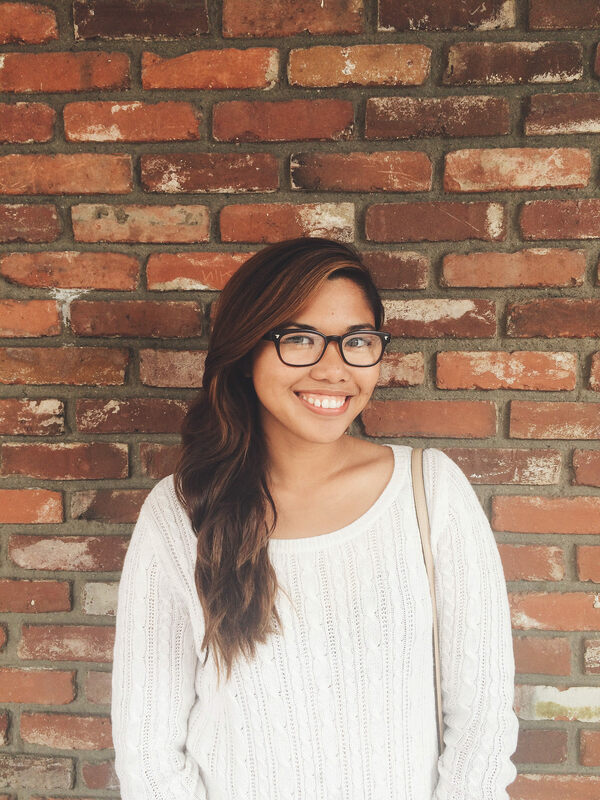 Don’t miss the opportunity to meet Miss Mindy! 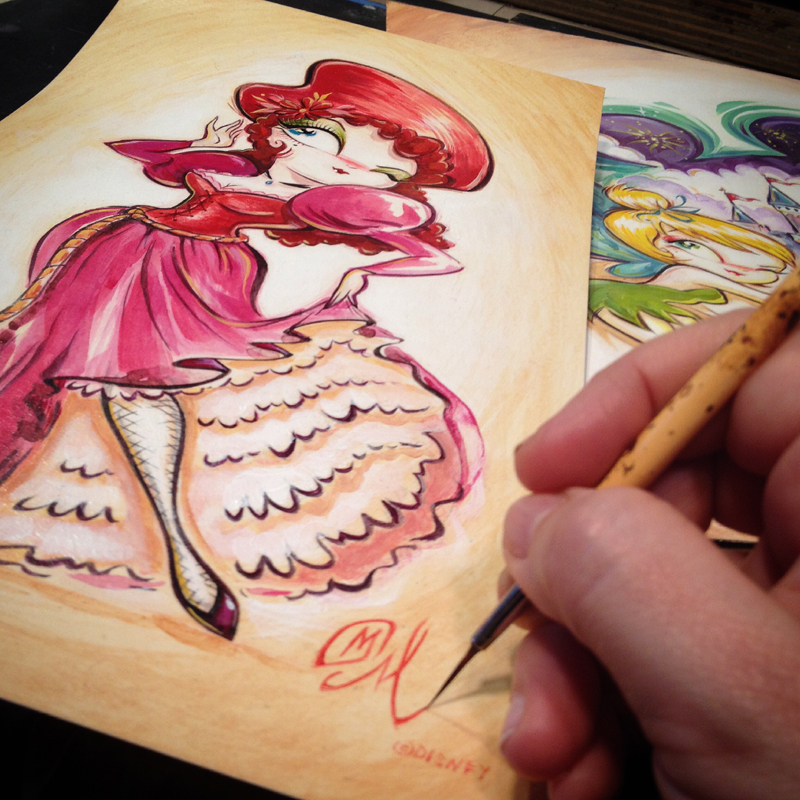 Miss Mindy will be at the WonderGround Gallery from 6:30–9:30 P.M. on October 23, 24, and 30. Miss Mindy is just pure magic in every way possible. Next story Here’s the last trailer + ticket information for “Star Wars: The Force Awakens”.